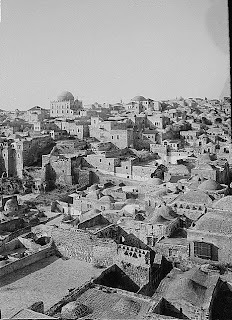 The Library of Congress archives lists this picture as "al-Aqsa," taken by the American Colony photographers sometime between 1898 and 1946. 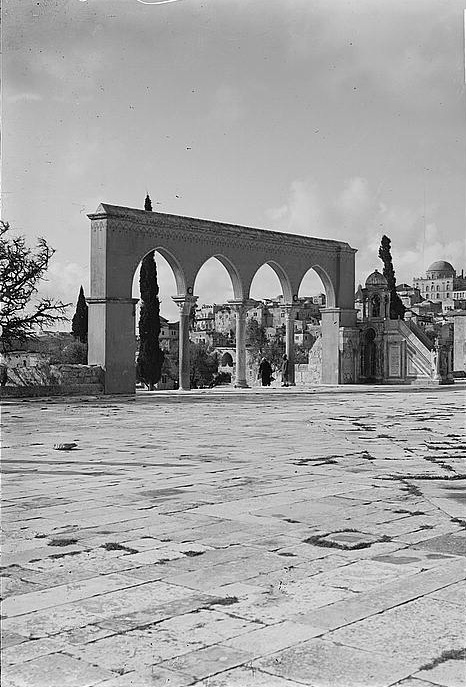 To be more exact it is the "Colonnade of Omar" located between the al-Aqsa mosque and the Dome of Rock, and it was probably taken in the early 1930s when the American Colony photographers focused their lenses on the rebuilding of the al-Aqsa after its partial destruction in the 1927 earthquake. 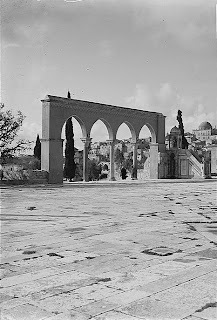 But we noticed something else in the picture, the prominent building on the hill to the right of the colonnade. The building is the Tiferet Yisrael Synagogue, also known as the Nissan Beck Synagogue, named for its founder. A Hassidic synagogue in the Old City, it was located near the equally prominent Hurva Synagogue founded by students of the Vilna Gaon who differed with the Hassidic movement on many issues. The synagogues' size, architectural prominence and commanding view were not popular among Muslims in the Old City; even the color of domes was reportedly a target of complaints. prior to the end of the British Mandate. 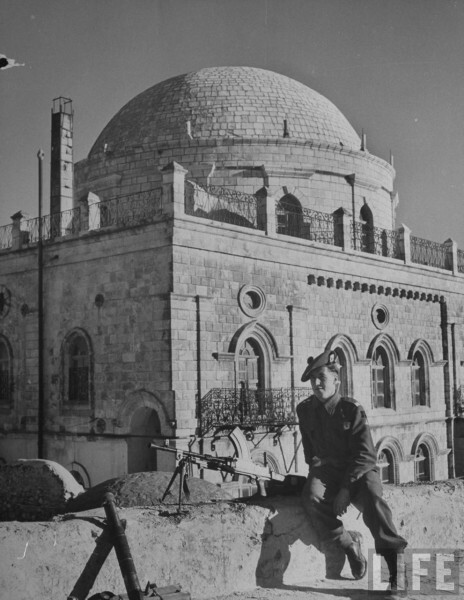 With the outbreak of the 1948 war, the synagogues were used as refuge for the Jewish residents of the Old City as well as military positions for the Jewish defenders. When the Jewish Quarter surrendered to the Jordanian Legion the two synagogues were blown up. 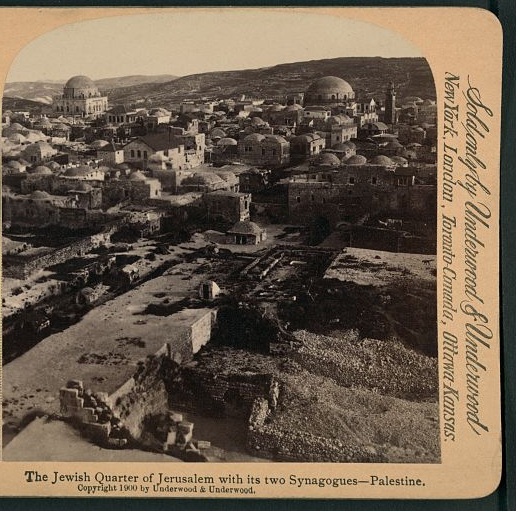 The Jewish Quarter and its religious institutions were razed. 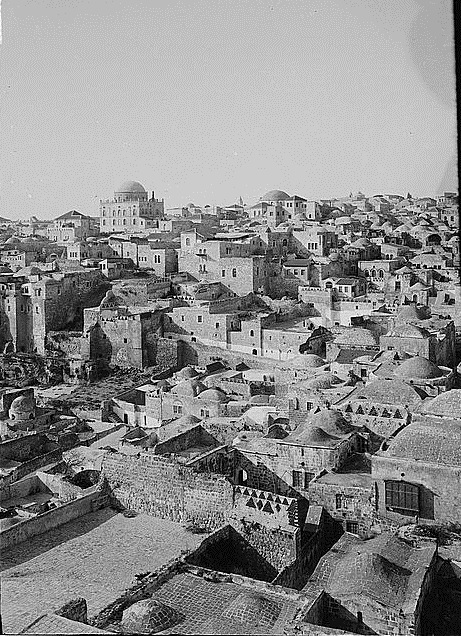 After the Israel Defense Forces captured the Old City in 1967, the Jewish Quarter and the Hurva synagogue were rebuilt. 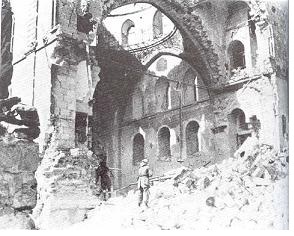 The Tiferet Yisrael Synagogue has yet to be rebuilt. 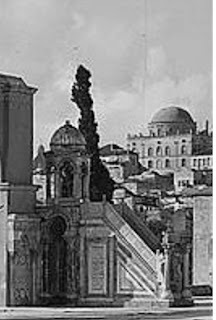 For more information on the Old City synagogues, click here and here for earlier photo essays. Click on pictures to enlarge. Click on the link below the picture to view the original. 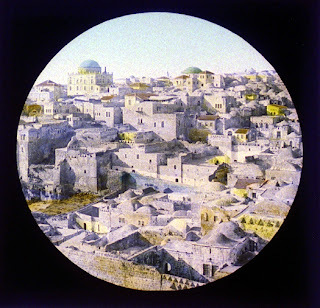 Subscribe to www.israeldailypicture.com to receive every photo essay by email. Enter your name in the box in the right sidebar to subscribe.